Accidentally sent a message to wrong person, Well don’t get panic you can easily recall mail in Outlook 2016 and other versions including 2013, 2010, 2007. While working on Outlook often it happens we sent message to other person to whom it was not meant for. The message could have important project files, attachments, reports which should be kept confidential with-in your team. 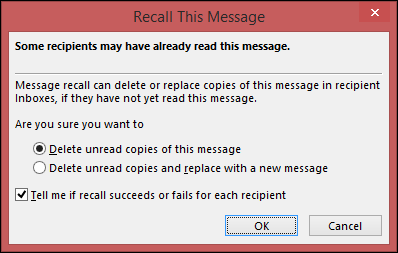 To retrieve back these messages you can use Recall this Message feature in Outlook. It really feels embarrassing when we sent a personal mail to someone else. Some user’s are not much aware of recall feature and here we will learn process to delete a sent mail in Outlook from server. Now look for the message you want to recall and double click on it to open. Single click opens message only in reading pane with less options. Recall this Message dialog box will open, Select Delete unread copies of this message and then OK. If you want to append the message, click on Delete unread copies and replace with a new message and compose the message as usual and click send. 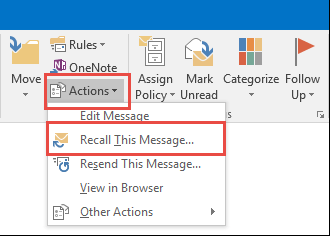 So by Recall this Message feature you can retrieve mails which has not been read by recipient and can even replace the message with a new one if you forgot to mention about an important file or attachment. In most of the case you can delete the sent mail from recipient’s server. So this is all about Recalling Message in Outlook. Hope you find this article useful.